A highly critical message to the developer of Carbon used to reside here for a month. Satisfied that he has read the message, I have decided to remove it. You can find the original review below of a product that no longer exist (abandoned), which is a shame as it had plenty of potential. Microsoft's Windows Phone 7 has an excellent social media integration, including support for Facebook, Twitter and Linkedin. Twitter is well integrated within the OS, but it is still missing a tons of functuinality such as searches, trends, reply to all, RTs, multiple accounts and more importantly, direct messages. Until Microsoft expands on the integration, it is up to third party clients to fill the void. Previous attempts by other third party developers has so far failed to capitalise on this. 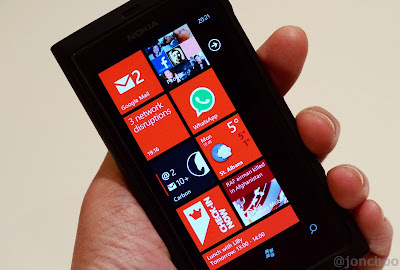 Most of these apps were plagued by either poor performance, lack of features or just plain broken. For example, Twitter's own official app on Windows Phone 7 isn't fit for purpose, and at times does not work at all. 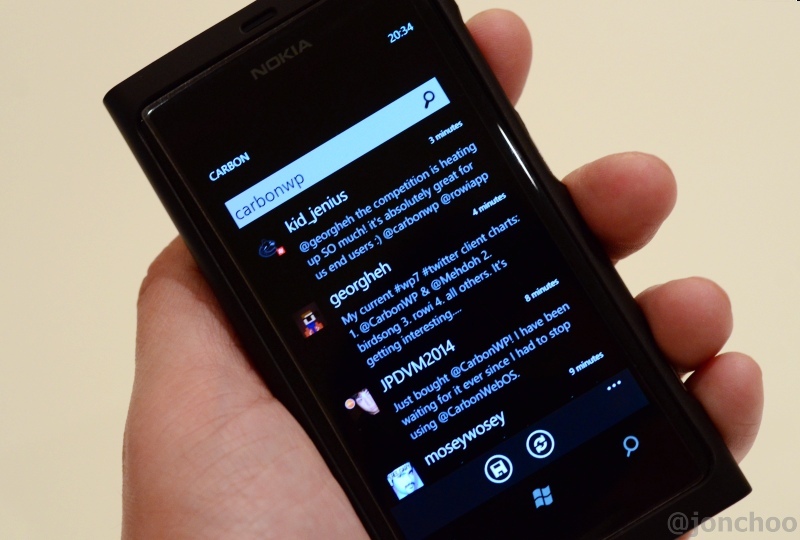 Carbon by dot & lines is the latest client to attempt to take advantage of this, and is the most anticipated Windows Phone 7 Twitter client I've tested yet. 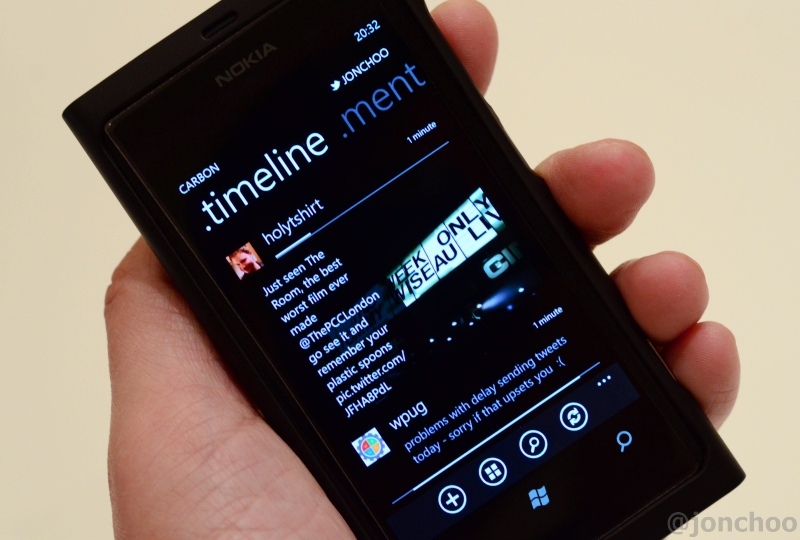 dots & lines has previous experience developing the award winning Carbon for WebOS, so anticipations were high on their Windows Phone 7 Mango debut. The project however hit a couple of snags when it failed Windows Phone Marketplace certification four times, mainly due to the developers not being too versed with the amount of red tape thrown by Microsoft. You can read about their trials and tribulation here. The client hit the Marketplace over the weekend, two months after its planed release. No trials were included, though the developers has stressed that the next version, due sometime this week, will include a trial. It costs £1.49 or US$1.99, which isn't much for a professionally done app. That is basically the price of half a pint of beer in a typical London pub, so to those moaning about the cost - don't! Quickline: a tab for accessing all kinds of timelines from Lists, Retweets, Saved Searches. It is clear from the UI of Carbon that the developers are very keen graphic designers. From a design perspective, the application looks gorgeous with clean lines, beautiful icons and makes great use of the Metro UI guidelines. Nothing bums me out more than developers who do not respect the user interface guidelines of whatever OS they are developing for. With Carbon for Windows Phone, dot & lines has created something that looks familiar to the customers of their webOS based client, but also respect the Windows Phone 7 UI guidelines. dot & lines has made a big deal about Carbon's Live Tiles integration. Each accounts can be pinned, with each Live Tile supporting both mentions and direct messages background checks. You can also pin search results and a compose tile - basically a short cut that goes right to the compose tile. While it is nice to see Live Tiles supported, I would like to see dot & lines go beyond the obvious and include the ability to pin individual twitter users, conversations that people may want to keep their eyes on, and even individual Twitter lists. Is it a killer app? well it depends on what kind of a twitter user you are. Carbon is by far the quickest Twitter client I've used on the platform. The UI and UX is brilliant, and while some features are still lacking, it works. There are issues loading some inline images from certain image hosting websites (Flickr, being particularly troublesome) but on a whole it does work smoothly. When scrolling through the timeline, expect some stuttering but this isn't as bad as it was on other WP7 Twitter apps. The app supports three separate font sizes. Small and medium are highly recommended for screen sizes 3.7"-4" and offers a good amount of readability while also allowing for more tweets to be shown. Another unique feature I found interesting is Quickline. The developers call it a Swiss Army-like feature that gives users a quick access to retweets, lists and saved searches. It is a nice feature that I would like to see expanded in the future. For example there are lists I would like to be able to permanently pinned as a tab. The developers has confirmed that at least two features that I would like to see are being developed for inclusion in future updates. These includes push notifications and filter - the ability to mute tweets based on users, clients or keywords. I would also like to see it gain the ability to increase the frequency of background checks, and the ability to hide retweets from the main timeline. There is one feature I wish to see excised is Twitlonger. Nothing irritates me more than seeing a Twitlonger tweet. Twitter is all about brevity. It doesn't affect me directly, but the inclusion of it will only encourage some other users to use it, thus ruining the Twitter experience for other people. There is a reason why many were against Deck.ly when Tweetdeck announced it. If you want to tweet more than 140 characters, get a blog. Is this the best mobile Twitter experience? No. While Carbon is the best Twitter client on Windows Phone 7, the features here doesn't come close offered by Twicca on Android (freeware), Tweetbot on iOS or Gravity on Symbian. Do not get me wrong, it is still a pretty darn good app for what is essentially a first release version. The developers has also promised many more updates to come and I do not doubt that they will deliver. Also, the fact that a quality app like Carbon exists on the Windows Phone 7 platform is a great thing and will hopefully spur others to better their own apps. 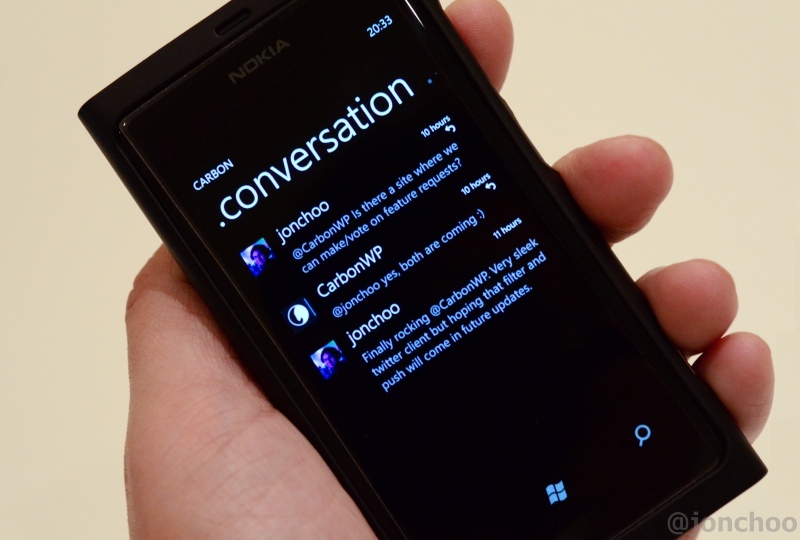 Carbon is available now on the Windows Phone 7 Marketplace for £1.49/US$1.99. 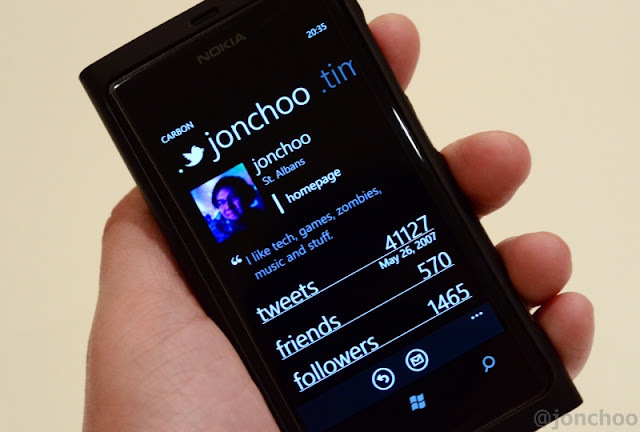 You can follow me on Twitter on @jonchoo. I have this but it needs instant notification badly. Have it installed alongside Rowi. Hear hear. I'm sick of small developers complaining about economics and how difficult it is for them to survive. If Carbon's dev haven't got the chops to develop, support and market an app, then they should get a job like the rest of us. There hasn't been an easier time to be a self published developer but what we are seeing is a new breed of developers who believe in instant success. When we started developing apps for mobile it took hardwork and plenty of time to build sales and trust. We learned the hard way that communication is a key factor. Nobody likes publishers who maintain silence over issues they are facing. There hasn't been an easier time to be a self published developer but what we are seeing is a new breed of developers who believe in instant success. When we started developing apps for iPhone and Android, it took hardwork and years to build the trust with our customer base. Communication is a key factor. Nobody likes publishers who maintain silence over issues they are facing.